Having shirts printed, especially in a large number, can be an expensive and confusing process. With so many different printers out there, it may be difficult to know where to start looking, or how to tell the difference between one printer and another. The quality your cheap t-shirts, quality of print, turnaround time, and more can all impact the final amount you pay for your shirts– but there are a few ways to make the process less painful. 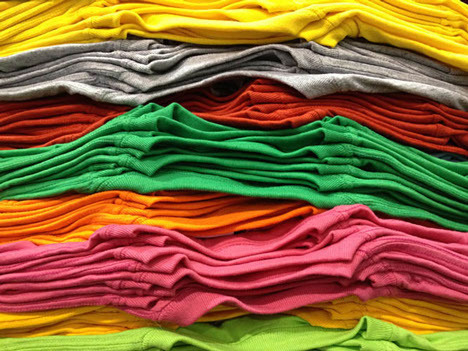 By buying blank t-shirts from a wholesaler like The Adair Group and taking them to a screen printer, you’ll save money on your total cost. Many shirt printers usually make money on both the blank shirts as well as on the prints. There are a wide variety of printers out there, each of whom can address different needs for their customers. There are many things to consider when picking a screen printer– here are some of the most important considerations. How important is price to you? Do you want the best print possible, and are you willing to pay for it? Would you rather have the cheapest price and go with a simple heat transfer? In many (but not all) cases you get what you pay for. Some printers have a quicker turnaround than others. Some printers run night shifts and can get your product turned around in a couple days, while other prints can take weeks. Figure out how much time you need, and shop around. How important is it to you that your printer is nearby? Do want or need to meet them face to face? Do you want to see the facility and examine your shirts as they come off the press? Additionally, price will factor in here. If you are printing a large number of shirts, the freight could be expensive if you are getting them printed out of state and shipped back to you. It’s crucial to make sure your printer has a good reputation. Ask to see work they’ve done, and ask to speak to other customers who have used their services. Make sure you find out how long the printer has been in business, and how up-to-date their equipment is.